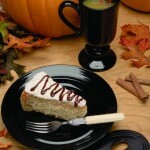 Excerpted from Dr. BBQ’s Halloween Barbecue Feast at Fiery Foods and Barbecue Central, this pumpkin cheesecake serves as a great alternative to pumpkin pie, bread, or the nasty wax mouth-hell we call “candy corn.” Just don’t let the trick-or-treaters see it or it’ll vanish as sure as if they were raccoons on a night raid. Which, when you think about it, they kind of are, aren’t they? In 9-inch by 3-inch springform pan, use a fork to stir together the graham-cracker crumbs, melted margarine or butter and sugar until moistened. With your hand, press the mixture onto bottom of the pan. Tightly wrap the outside of pan with heavy-duty foil to prevent leakage when baking in the water bath later. Bake the crust for 10 minutes. Allow it to cool completely in the pan on a wire rack. In a large bowl, using a mixer at medium speed, beat the cream cheese until smooth; slowly beat in the sugar until blended, about 1 minute, scraping the bowl often with a rubber spatula. With the mixer at low speed, beat in the pumpkin, sour cream, bourbon or vanilla, cinnamon, allspice, and salt. Add the eggs, 1 at a time, beating just until blended after each addition. Pour the pumpkin mixture into the pre-baked crust and place it in large roasting pan. Place the pan on the oven rack. Carefully pour enough boiling water into pan to come 1 inch up the side of the springform pan. 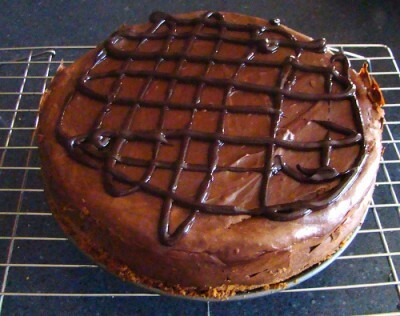 Bake the cheesecake for 1 hour and 10 minutes or until the center barely jiggles. Meanwhile, prepare the Sour-Cream Topping. In a small bowl, with a wire whisk, beat the sour cream, sugar, and vanilla until blended. Remove the cheesecake from the water bath, leaving the water bath in oven, and spread the sour-cream mixture evenly over the top of the cake. Return the cake to the water bath and bake 5 minutes longer. Remove the cheesecake from the water bath to a wire rack and discard the foil. With a small knife, loosen the cheesecake from the side of the pan to help prevent cracking during cooling. Cool the cheesecake completely. Cover and refrigerate the cheesecake at least 6 hours or overnight, until well chilled. Remove the side of pan to serve.